The Los Angeles Basin is a sedimentary basin located in southern California, in a region known as the Peninsular Ranges. The basin is also connected to an anomalous group of east-west trending chains of mountains collectively known as the California Transverse Ranges. The present basin is a coastal lowland area, whose floor is marked by elongate low ridges and groups of hills that is located on the edge of the Pacific plate. 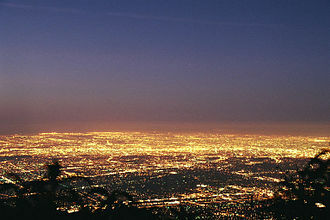 The Los Angeles Basin, along with the Santa Barbara Channel, the Ventura Basin, the San Fernando Valley, and the San Gabriel Basin, lies within the greater southern California region. On the north, northeast, and east, the lowland basin is bound by the Santa Monica Mountains and Puente, Elysian, Repetto hills. To the southeast, the basin is bordered by the Santa Ana mountains and the San Joaquin Hills. The western boundary of the basin is marked by the Continental Borderland and is part of the onshore portion. The California borderland is characterized by north-west trending offshore ridges and basins. The Los Angeles Basin is notable for its great structural relief and complexity in relation to its geologic youth and small size for its prolific oil production. Yerkes et al. identify 5 major stages of the basin's evolution that begins in the Upper Cretaceous and ends in the Pleistocene. This basin can be classified as an irregular pull-apart basin accompanied by rotational tectonics during the post-early Miocene. During pre-Turonian, metamorphosed sedimentary and volcanic rocks are present that serve as the two major basement rock units for the LA Basin. Large-scale movement along the Newport–Inglewood zone juxtaposed the two bedrock units along the east and west margins. During this phase, the basin was above sea level. The hallmarks of this phase were successive shoreline transgression and regression cycles. Deposition of older marine and non-marine sediments began to fill the basin. Towards the end of this phase, the shoreline began to retreat and deposition continued. After the deposition of the pre-Turonian units, there was a large emergence and erosion that can be observed as a major unconformity at the base of the middle Miocene units. Emergence did not occur at the same rate or in all sections of the basin. During this time, the basin was covered by a marine embayment. Rivers sourced in the highlands brought large amounts of detritus to the northeastern edge of the basin. During this period, the Topanga formation was also being deposited. The present form and structural relief of the basin was largely established during this phase of accelerated subsidence and deposition which occurred during the late Miocene and continued through the early Pleistocene. Clastic sedimentary rocks from the highland areas (to the north and east) moved down the submarine slopes and infilled the basin floor. Subsidence and sedimentation most likely began in the southern portion basin. Subsidence and Deposition occurred simultaneously, without interruption, until the late Pliocene. Until the rate of deposition gradually overtook the rate of subsidence, and the sea level began to fall. Towards the end of this phase, the margins of the basin began to rise above sea level. During the early Pleistocene, deposition began to outpace subsidence in the depressed parts of the basin and the shoreline began to move southward. This phase also had movement along the Newport–Inglewood fault zone that resulted in the initiation of the modern basin. This movement caused the southwestern block to be uplifted relative to the central basin block. The central part of the basin continued to experience sediment deposition through the Pleistocene from flooding and erosional debris from the surrounding mountains and Puente Hills. This infill was responsible for the final retreat of the shoreline from the basin. Deposition in the Holocene is characterized by non marine gravel, sand and silt. This phase also includes the late stage compressional deformation responsible for the formation of the hydrocarbon traps. Four major faults are present in the region and divide the basin in the central, northwest, southwest, and northeast structural blocks. These blocks not only denote their geographic location, but they indicate the strata present and major structural features. The southwestern block was uplifted prior to the middle Miocene and is composed mostly of marine strata and contains two major anticlines. This block also contains the steeply-dipping Palos Verdes Hills fault zone. The middle Miocene volcanics can be seen locally within the southwest block. The northwestern block consists of clastic marine sediments of Late Cretaceous to Pleistocene age. Middle Miocene volcanics are also present. This block has a broad anticline that is truncated by the Santa Monica fault zone. The central block contains both marine and non-marine clastic rock units interbedded with volcanic rocks that are late Cretaceous to Pliocene in age. Pliocene and Quaternary strata are most visible within the central block. Structurally, there is a synclinal trough. The northeastern block contains fine to coarse grained clastic marine rocks of Cenozoic age. Locally, middle Miocene volcanics can be seen as well as Eocene to Miocene aged non-marine sedimentary rocks. There is also an anticline in the northeastern block. Homogeneous evolution of this basin did not occur due to dynamic tectonic activity. Despite the active setting, there are over 9,100 m of strata within the basin. The dynamic setting was also responsible for the heterogeneous deposition of each formation. It is common for rock units of the same depositional event to have different names in different locations within the basin. This may be a result of large variation in clast size as with the upper Pliocene Pico Formation in the northwestern part of the basin and the Upper Fernando Formation in the southwest part of the basin. 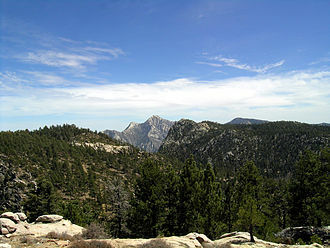 The Los Angeles Basin contains what is known as the "Great Unconformity" which has been interpreted as a large scale erosional event in the basement rock unit. This unconformity is used to correlate strata throughout the basin. The record of the Cenozoic activity begins above this unconformity. The stratigraphic record for this basin indicates that it began as a non-marine environment and then transgressed to a deep ocean system. The oldest basement units of this basin are of both sedimentary and igneous origin. The sedimentary unit was metamorphosed as a result of slippage of the Newport–Inglewood fault and is known as the Catalina Schist. The Catalina Schist can be found on the southwestern edge of the basin and is predominantly a chlorite-quartz schist. Closer to the Newport–Inglewood fault zone, garnet-bearing schists and metagabbros occur. The Santa Monica Slate can be observed in the northwestern block of the basin. The eastern complex is characterized by Santiago Peak Volcanics. This rock unit contains andesitic breccias, flow, agglomerates and tuffs. The Sespe Formation is the first to appear above the "Great Unconformity" and is marked by interbedded mudstones, sandstones and pebbly sandstones. This bed sequence indicates an alluvial fan, meandering stream or braided stream origin. Upward from the Sespe Formation toward the Vaqueros, the grains become finer and the beds become thinner; indicating a transition to a shallow marine environment. The Vaqueros Formation is marked by two sandstone, siltstone and shale units. There are also characteristic mollusk fossils that indicate the area was dominately shallow marine. The Topanga Group is the next major formation in the stratigraphic sequence and infills the topography on older rocks. It is a mixed sedimentary and volcanic unit whose base is an erosional unconformity. The unit consists of 3 parts: First is a basal marine conglomeratic sandstone, followed by a dominantly basaltic middle layer of multiple submarine lava flows and tuffs. The youngest part of this unit is a sedimentary breccia, conglomerate, sandstone, and a siltstone. The earliest deposits of the Topanga Group appear to reflect the continuation of a shift in shoreline that can be seen in both the Sespe and Vaqueros formations. Eruptions from one or more of volcanic centers locally and temporarily interrupted sedimentation. The Puente Formation is a deep-marine formation that is characterized by pro-delta sediments and an overlapping fan system. This unit lies above the Topanga Group giving it a Late Miocene depositional age and is divided into four members. The La Vida Member is a micaceous, platy siltstone with subordinate amounts of thin-bedded feldspathic sandstone. The next member is the Soquel, which is a thick bedded to massive micaceous sandstone. Locally abundant siltstone, conglomerate, and intraformational breccia can also be seen in this member. Above the Soquel lies the Yorba Member. This member is a sandy siltstone that is interbedded with a fine-grained sandstone. The Sycamore Canyon Member contains lenses of conglomerate, conglomeratic sandstone, and sandstone. Sandy siltstone and fine-grained sandstones are interbedded with the aforementioned rock types. The Monterey Formation is characterized by abnormally high silica content compared to most clastic rocks. There are also silica-cemented rocks known as porcelanite and porcelanite shale. While this formation has distinguishable beds, there are many shale, sandstone, and mudstone beds that have normal amounts of silica. This sequence of this formation indicates an off-shore marine environment. The Fernando Formation is split into two sub-facies known as the Pico and Repetto Members. These members represent a distinct change in the depositional environment and are of Pleistocene age. The Repetto is the older of the two members and is composed of interbedded fine to coarse grained siltstone, mudstone, and sandstone. The Pico Member is mostly made of massive siltstones and sandstones interbedded with minor silty-sandstones. Holocene Alluvium and Quaternary sediments is a largely unconsolidated unit and is composed mostly of gravel and floodplain sediments. The sediments that mark the top of the basin can be found in modern streams/rivers and at the base of the foothills. The history of this basin begins with the subduction of Pacific plate underneath the North American plate in the beginning of the Mesozoic. During this subduction event, two smaller plates, the Monterey and Juan de Fuca plates, also began to subduct underneath the North American plate. Around 20Ma, the Monterey plate attached to and followed the motion of the Pacific plate. Later, subduction of the Pacific-Monterey ceased and the plate margin was converted to a transform boundary. The North America/Pacific-Monterey transform boundary began to move north and created crustal extension. This rifting was accompanied with the rotation of the western Transverse Ranges. This rotation is responsible for the placement and northwest-southeast orientation of the LA Basin. Early in the Miocene, before deposition of the Topanga, high heat flow and transtension caused the extension of the basin. As the crust thinned, the basin began to subside from isostatic pressure as a result of large amounts of sediment deposition. Because the basin lies on the boundary of the Transverse and Peninsular Ranges, this basin experiences both compressional and strike slip tectonics. During the early Pliocene, also identified as the "Basin Disruption" phase, deformation and folding occurred as a result of fault movement and a slight rotation event. 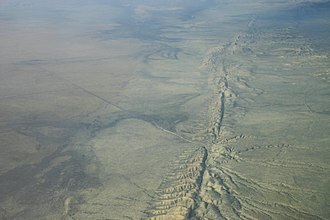 While movement along the San Andreas Fault is responsible for the placement of the basin, it is the Whittier and Newport–Inglewood faults that have dictated the seismic behavior within the basin. The Los Angeles basin is still active tectonically and the region continues to experience earthquakes as a result. Due to the number of faults and fault splays, seismic activity is not concentrated in one particular area. The cities that are overlain by the Newport–Inglewood and Whittier fault zones have a higher probability of experiencing seismic activity. The region experiences earthquakes that are mostly mild (magnitude ≤2.25). However moderate earthquakes (magnitude 4.9 to 6.4) have been reported. Earthquakes of moderate magnitude are very infrequent. This fault zone is the most notable feature within the basin that is a single strand with local (fault) splays. The fault zone is also marked by low hills, scarps, and ten anticlinal folds in a right-stepping en echelon pattern. It is located in the southwest portion of the basin and is a strike-slip margin. There are several oil fields that run parallel to this fault. This fault lies on the eastern border of the basin and mergers with the Elsinore Fault in the canyon of the Santa Ana river, one of the upper branches of the fault. This fault is a reverse right-oblique fault. It is most known for the Whittier, Brea-Olinda, Sansinena, oil fields. 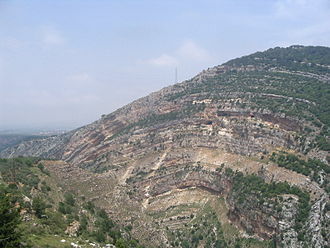 There is an anticline that runs parallel to the Whittier fault that is evidence for compressional deformation during the late Miocene to early Pliocene. Thinning and pinch-out of the Pliocene sandstones are evidence for uplift during this same time period. The Anaheim nose is a subsurface feature that was discovered by geophysical surveys and exploratory drilling in 1930. 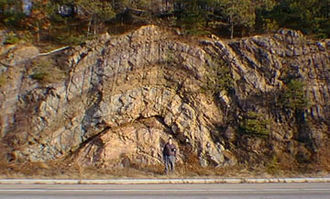 It is a mid-Miocene fault block that revealed a northwest trending ridge of Paleocene age rocks. This structural feature is important because it revealed many oil traps and orientation of the beds indicate the age of subsidence in this portion of the basin. 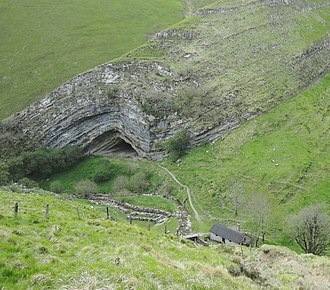 This particular anticline is the most notable subsurface feature within the basin. Deformation events such as erosion of the uplifted crustal blocks, initiation of various faults, and the development of the submarine channel led to the anticline's formation. Fold initiation began in the late-Miocene to early Pliocene period of deformation. There are many other anticlines within the basin and isopach data suggests that the formation of these folds occurred mostly during the Pliocene. The La Brea Tar Pits are pools of stagnant asphaltum that have been found on the basin's surface. These "pools" are important because hundreds of thousands of late Pleistocene bones and plants have been found. These pits allowed scientists to better understand the ecosystem at that particular point in the geologic past. Accumulations of oil and gas occur almost wholly within strata of the younger sequence and in areas that are within or adjacent to the coastal belt. The Puente formation has proved to be the most notable reservoir for petroleum in the basin. 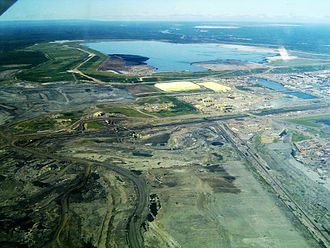 The primary reason for the high abundance of oil is because the oil sands are well saturated within the basin. The thickness of these oil sands range from hundreds to thousands of feet. Anticlines and faulted anticlines are the structural features that are also responsible for trapping oil. 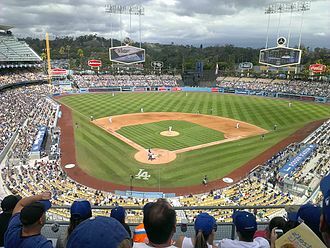 The first reported oil-producing well was discovered in 1892 on the land that is presently beneath Dodger Stadium. This basin was responsible for half of the states oil production until the (90's?). 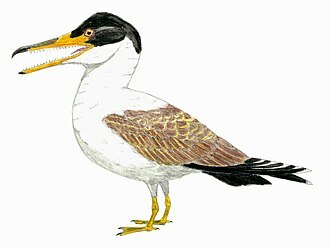 This is remarkable due to the relatively small size and youth of the basin. The basin currently has about 40 active oil fields that collectively have 4,000 operating wells. In 1904, there were over 1,150 wells in the city of Los Angeles alone. Tight spacing and continued pumping of the wells resulted in most of the wells to dry up. Most recent data indicates that 255 million barrels of oil were produced in 2013. This is a large decline from the almost 1 billion barrels per year produced in the late 1970s. ^ a b c d e f Jahns, Richard (1973). "A Profile of Southern California Geology and Seismicity of the Los Angeles Basin". Pacific Section of AAPG: i–xxvii. ^ Yeats, Robert (2004). "Tectonics of the San Gabriel Basin and surroundings, southern California". Geological Society of America. 116 (9): 1158–1182. Bibcode:2004GSAB..116.1158Y. doi:10.1130/b25346.1. ^ a b c d e f g h i j k l m n o p Yerkes, R.; McCulloch, T.; Schoellhamer, J.; Vedder, J. (1965). "Geology of the Los Angeles Basin, California- An Introduction". Geological Professional Survey Paper: A1–A55. ^ a b c d Bilodeau, William; Bilodeau, Sally; Gath, Eldon; Oborne, Mark; Proctor, Richard (May 2007). "Geology of Los Angeles, United States of America". Environmental & Engineering Geoscience. XIII (2): 99–160. doi:10.2113/gseegeosci.13.2.99. ^ a b Biddle, Kevin (30 May 1990). 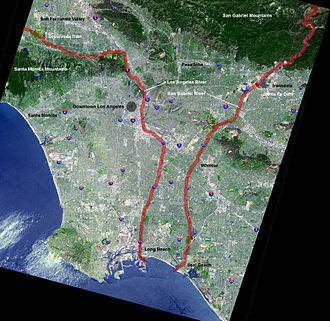 "The Los Angeles Basin: An Overview". American Association of Petroleum Geologists, A Memoir. 52: 5–24. ^ Crouch, James; Suppe, Jonh (November 1993). "Late Cenozoic Tectonic Evolution of the Los Angeles Basin and Inner California Borderland: A Model for Core Complex-Like Crustal Extension". Geological Society of America Bulletin. 105 (11): 1415–1435. Bibcode:1993GSAB..105.1415C. doi:10.1130/0016-7606(1993)105<1415:LCTEOT>2.3.CO;2. ^ a b c d Lyons, Kevin (1991). Sequence Stratigraphy and Facies Architecture of Slope and Submarine Fan Deposits, Miocene Puente Formation, Los Angeles Basin California. Dallas, Texas: Southern Methodist University. ^ a b Simmone, Rhonda (1993). Diagenetic Evolution of Clastic Sediments in the Los Angeles Basin: Time and Temperature Effects. Dallas, Texas: Southern Methodist University. ^ a b c d Hauksson, Egill (10 September 1990). "Earthquakes, Faulting, and Stress in the Los Angeles Basin". Journal of Geophysical Research. 95 (B10): 15,365–15,394. Bibcode:1990JGR....9515365H. doi:10.1029/jb095ib10p15365. ^ a b c d e f g h i Wright, Thomas (1991). 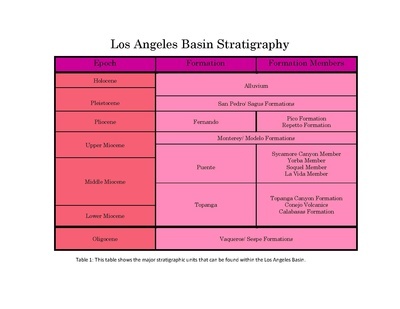 Structural Geology and Tectonic Evolution of the Los Angeles Basin. San Anslemo, California, U.S.A.: American Association of Petroleum Geologists, A Memoir. pp. 34–135. ^ a b c d Colburn, I; Schwartz, D (1987). "Late Tertiary Chronology of the Los Angeles Basin, Southern California". Society of Sedimentary Geology: 5–16. ^ MuCulloch, Thane; Fleck, Robert; Denison, Roger; Beyer, Larry; Stanley, Richard (2002). "Age and Tectonic Significance of Volcanic Rocks in the Northern Los Angeles Basin, California". USGS: 1–12. ^ Campbell, Russell; MuCulloch, Thane; Vedder, John (2009). "The Miocene Topanga Group of Southern California- 100 Year History of Changes in Stratigraphic Nomenclature". USGS: 1–36. ^ a b Bramlette, M. N. (1946). "The Monterey Formation of California and the Origin of its Siliceous Rocks". The Department of the Interior: 1–55. ^ a b Schnider, Craig; Hummon, Cheryl; Yeats, Robert; Huftile, Gary (April 1996). "Structural Evolution of the Northern Los Angeles Basin, California, Based on Growth Strata". Tectonics. 15 (2): 341–355. Bibcode:1996Tecto..15..341S. doi:10.1029/95tc02523. ^ LUYENDYK, BRUCE P.; KAMERLING, MARC J.; TERRES, RICHARD (1980-04-01). "Geometric model for Neogene crustal rotations in southern California". GSA Bulletin. 91 (4): 211. doi:10.1130/0016-7606(1980)91<211:gmfncr>2.0.co;2. ISSN 0016-7606. ^ Nicholson, Craig; Sorlien, Christopher; Atwater, Tanya; Crowell, John; Luyendyk, Bruce (June 1994). "Microplate Capture, Rotation of the Western Transverse Ranges, and Initiation of the San Andreas Transform as a Low-Angle Fault System" (PDF). Geology. v.22 (6): 491–495. Bibcode:1994Geo....22..491N. doi:10.1130/0091-7613(1994)022<0491:MCROTW>2.3.CO;2. Retrieved 18 February 2015. ^ Hill, Mason (October 1971). "Newport Inglewood Subduction and Mesozoic Subduction, California". Geological Society of America Bulletin. 82 (10): 2957–2962. Bibcode:1971GSAB...82.2957H. doi:10.1130/0016-7606(1971)82[2957:nzamsc]2.0.co;2. ^ Arnold, Ralph; Loel, Wayne (July–August 1922). "New Oil Fields in the Los Angeles Basin". Bulletin of the American Association of Petroleum Geologists. 6 (4): 303–316. ^ "Petroleum & Other Liquids: California- Los Angeles Basin Onshore Crude Oil Provided Reserves". U.S. Energy Information Administration. U.S. Department of Energy. Retrieved 18 February 2015. 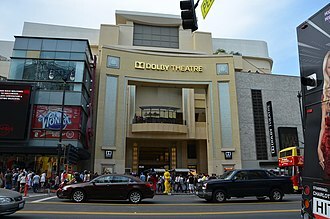 The Beverly Hills Oil Field is a large and currently active oil field underneath part of the city of Beverly Hills, California, USA, and portions of the adjacent city of Los Angeles. Annual production from the field was 1, the three largest operators as of 2009 were independent oil companies Plains Exploration & Production, BreitBurn Energy, and Venoco, Inc. The field is long and narrow, about four miles long by a half-mile to mile across. From north to south the field is much narrower, extending near the middle of the field from near Monte Mar Drive in Los Angeles to about two blocks north of Olympic Blvd in Beverly Hills. The total productive area of the field, projected to ground surface, in most oil fields, wells are drilled at optimum spacing for petroleum extraction with the boreholes going straight down into the target formations. This facility houses storage tanks, several oil-water separator units, a house, compressor house. A facility similar to the one adjacent to Beverly Hills High School, yet another drilling island, the largest of the four, containing over fifty active wells and operated by Plains Exploration & Production, is north of Pico between Genesee Avenue and Spaulding Avenue. This drilling island contains wells that angle northeast into the Salt Lake Oil Field and this small drilling island includes 12 active wells directionally drilled into the Beverly Hills Oil Field, as well as several others drilled into the Cheviot Hills Field. The operators of a fifth drilling island, located at the corner of Avenue of the Stars and Constellation Boulevard in Century City. Originally constructed in the 1950s on what was an unused back lot of Twentieth Century Fox Studios, its production declined in the 1970s. 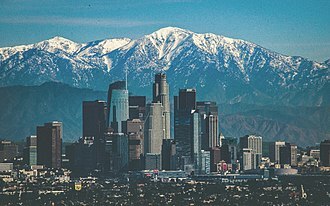 Land use changes and soaring real estate values contributed to its elimination, the city of Los Angeles handles all building permits and air permitting issues for the oil field. The field is an anticlinal structure with oil trapped by a combination of structural. Bounding the field on the south is the Brentwood-Las Cienegas Fault, the minimum depth to the larger deposits of profitably extractable oil varies from about 5600 to about 7,200 feet below ground surface, or 5400 to 7,000 feet below sea level. The San Fernando Valley is an urbanized valley located in Los Angeles County, defined by the mountains of the Transverse Ranges circling it. Home to 1.8 million people, it lies north of the larger, nearly two thirds of the valleys land area is part of the city of Los Angeles. The other incorporated cities in the valley are Glendale, San Fernando, Hidden Hills, the Los Angeles River begins at the confluence of Calabasas Creek and Bell Creek, between Canoga Park High School and Owensmouth Ave. in Canoga Park. 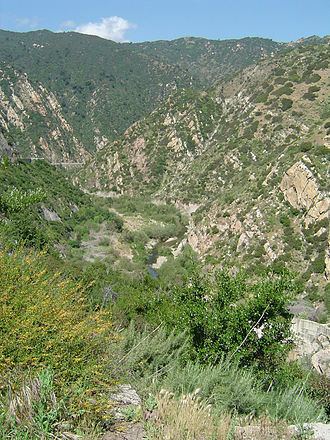 These creeks headwaters are in the Santa Monica Calabasas foothills, the Simi Hills Hidden Hills, Santa Susana Field Laboratory, the river flows eastward along the southern regions of the Valley. One of the rivers two unpaved sections can be found at the Sepulveda Basin, a seasonal river, the Tujunga Wash, drains much of the western facing San Gabriel Mountains and passes into and through the Hansen Dam Recreation Center in Lake View Terrace. It flows south along the Verdugo Mountains through the communities of the valley to join the Los Angeles River in Studio City. Other notable tributaries of the river include Dayton Creek, Caballero Creek, Bull Creek, Pacoima Wash, the elevation of the floor of the valley varies from about 600 ft to 1,200 ft above sea level. 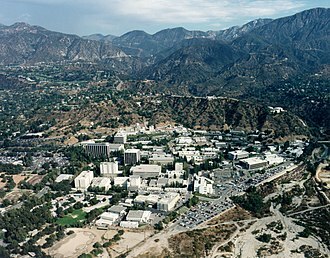 Universal City, an enclave in the part of the valley, is unincorporated land housing the Universal Studios filming lot. Mulholland Drive, which runs along the ridgeline of the Santa Monica Mountains, in this Mediterranean climate, post-1790s European agriculture for the missions support consisted of grapes, figs and general garden crops. 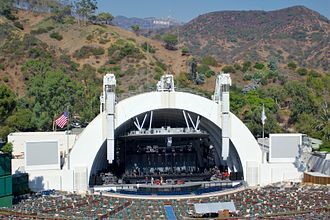 The San Fernando Valley contains five incorporated cities—Glendale, San Fernando, Hidden Hills and Calabasas—and part of a sixth, Los Angeles, the unincorporated communities are governed by the County of Los Angeles. 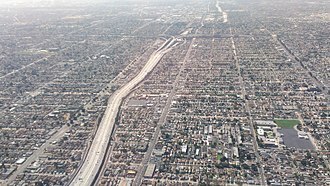 The Los Angeles city section of the valley is divided into seven city districts,2,3,4,5,6,7 and 12. Of the 95 neighborhood councils in the city,34 are in the valley, the valley is represented in the California State Legislature by seven members of the State Assembly and five members of the State Senate. The Oxnard Plain is a large coastal plain in southwest Ventura County, United States surrounded by the mountains of the Transverse ranges. The 16. 5-mile-long coastline is among the longest stretches of continuous, Ventura County is one of the principal agricultural counties in the state and it is a significant component of the economy with a total annual crop value in the county of over $1.8 billion in 2014. There is strong sentiment for retaining agricultural production, as reflected in the SOAR initiatives that have been approved by voters. This plain has been formed chiefly by the deposition of sediments from Santa Clara River and this plain contained a series of marshes, salt flats and lagoons prior to the expansion of agriculture. 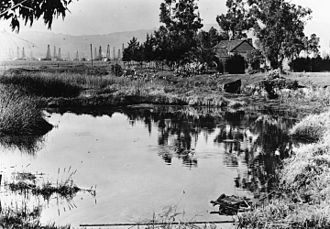 The Santa Clara River is one of the largest river systems along the coast of Southern California, there are several smaller abandoned oil fields. 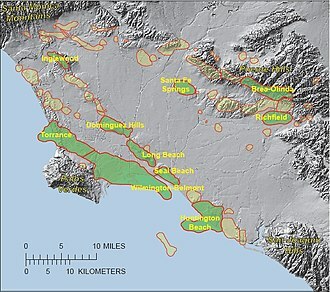 Oil facilities are interspersed with agricultural land uses both east and west of Oxnard, Human settlement at over 5000 B. C. E. has been documented in nearby coastal sites. The presence or absence of water is a predictor of site location in Southern California. Several sites have documented at Mugu Lagoon. Spanish explorers made sailing expeditions along the coast of southern California between the mid-1500s and mid-1700s, in the 18th century, Spain began the colonization and inland exploration of Alta California. They established a system consisting of missions, presidios. Mission San Buenaventura was founded in 1782 next to the Ventura River,10 miles upcoast from the Santa Clara River, the Oxnard plain was used for grazing herds of livestock which required thousands of acres. The traditional way of life of the Chumash people became increasingly unstable and unsustainable on the Oxnard Plain with the introduction of these animals. The destruction wrought by the livestock and shortages of wild plants that used for food may have made the missions appear to be the only viable alternative to a disintegrating way of life. At its peak in 1816, the mission had over 41,000 animals including 23,400 cattle,12,144 sheep, the 4,493 horses constituted one of the largest stables of horses of the California mission sites. The Wilmington Oil Field is a prolific petroleum field in Los Angeles County in southern California in the United States. Discovered in 1932, it is the third largest oil field in the United States in terms of oil production. The field runs roughly southeast to northwest through the Los Angeles Basin, stretching from the middle of San Pedro Bay through Long Beach, the field originally contained approximately 3 billion barrels of reserves. As of 2002, approximately 90% of its reserves had been recovered. In 2013, the USGS estimated future potential production from the combined Wilmington-Belmont oilfield could be around 900 million barrels, the offshore portion of the oil field is developed largely through wells drilled directionally from THUMS Islands, four artificial islands in Long Beach Harbor. All figures are as of 31 December 2001, an offhore seismic survey in 1954 showed the field extended some miles to the southeast. The anticline plunges to the northwest and is separated from the Torrance Oil Field by a saddle, a series of transform faults divides the field into separate blocks which form barriers to fluid movement and pressure changes. 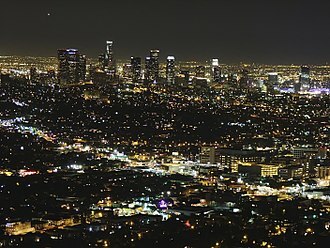 The Los Angeles metropolitan area averages year-round moderate-to-warm weather. Under the modified Köppen climate classification, the coast is classified as Csb, some areas of the city may be defined as semi-arid climates due to the low annual rainfall in combination with high mean temperatures. Downtown is a mediterranean climate but only narrowly above the semi-arid climate with precipitation being limited even during winter. Summers are warm to hot, and nearly completely dry, the summer temperature pattern usually begins in late June or early July, and lasts through October or November, although it may start as early as May. In August, the average high/low at the University of Southern California downtown campus are 84.8 °F and 65.6 °F. Winters are mildly cool to warm, with high temperatures at the Downtown/USC weather station of 68 °F and lows of 48 °F. However, high pressure systems over the deserts often bring the Santa Ana winds, resulting in hot, temperatures reach into the 80 to 90 °F range routinely during Santa Ana Winds even in December and January. Almost every winter season, temperatures reach above 90 °F at least once during a Santa Ana-type event, sunny skies characteristically dominate the weather pattern even in the winter season. Spring and autumn hardly exist as such in this climate, summer temperature patterns of 75 to 90 °F highs and 60 to 70 °F lows usually persist until mid-November. The rainy season almost always ends by mid-May, June is normally a transitional month of less-volatile temperatures between 60 and 80 °F, with increased cloudy days and the disappearance of the Santa Ana winds. Rainfall, on average, is quite low, most rain occurs during winter and early spring, typical of a Mediterranean climate. However, the amount received is usually lower than in other Mediterranean climates, the first sporadic rainfall of the rainy season usually occurs in October or November, with rain becoming more common December through February. February, on average, is the wettest month, the rains taper off in March, and April and May usually see only one or two light rains. Subsidence is the motion of a surface as it shifts downward relative to a datum such as sea level. The opposite of subsidence is uplift, which results in an increase in elevation, ground subsidence is of concern to geologists, geotechnical engineers and surveyors. Subsidence frequently causes problems in karst terrains, where dissolution of limestone by fluid flow in the subsurface causes the creation of voids. If the roof of these voids becomes too weak, it can collapse and this type of subsidence can result in sinkholes which can be many hundreds of meters deep. Several types of mining, and specifically methods which intentionally cause the extracted void to collapse will result in surface subsidence. Mining-induced subsidence is relatively predictable in its magnitude and extent, mining-induced subsidence is nearly always very localized to the surface above the mined area, plus a margin around the outside. Where mining activity is planned, mining-induced subsidence can be successfully managed if there is co-operation from all of the stakeholders and this is accomplished through a combination of careful mine planning, the taking of preventive measures, and the carrying out of repairs post-mining. If natural gas is extracted from a gas field the initial pressure in the field will drop over the years. The gas pressure supports the soil layers above the field, if the pressure drops, the soil pressure increases and this leads to subsidence at the ground level. Since exploitation of the Slochteren gas field started in the late 1960s the ground level over a 250 km² area has dropped by a current maximum of 30 cm, the Geospatial Information Authority of Japan reported immediate subsidence caused by the 2011 Tōhoku earthquake. In Northern Japan, subsidence of 0.50 m was observed on the coast of the Pacific Ocean in Miyako, Tōhoku, while Rikuzentakata, in the south at Sōma, Fukushima,0.29 m was observed. The maximum amount of subsidence was 1.2 m, coupled with horizontal diastrophism of up to 5.3 m on the Oshika Peninsula in Miyagi Prefecture, the habitation of lowlands, such as coastal or delta plains, requires drainage. The resulting aeration of the leads to the oxidation of its organic components, such as peat. The Santa Barbara Channel is a portion of the Pacific Ocean which separates the mainland of California from the northern Channel Islands. It is generally south of the city of Santa Barbara, during the last ice age, the four northern Channel Islands, including Santa Rosa Island, were conjoined into Santa Rosae, a single island that was only five miles off the coast. The Santa Barbara Channel is considered a location, with the islands visible from the mainland on clear days. Excursion boats cross the channel, taking visitors to watch whales, in the perpendicular direction, huge cargo ships and tankers occupy a major shipping lane on their way to or from the ports of Los Angeles and Long Beach. The Channel is the location of oil fields, some of which have substantial reserves. These include the Ellwood, Carpinteria offshore and Dos Cuadras fields, some oil exploration and production activities continue in the area, in spite of vigorous opposition from local organizations, such as Santa Barbara-based Get Oil Out. The Santa Barbara Channel contains the worlds largest natural oil seepage - Coal Oil Point, goleta Point is a nearby extension into the channel. Prior to the Holocene era sea levels were lower, such that the water width separating the mainland was much less. This effect had a significant effect upon biological colonization as well as human transport via plank canoes, as examples, the Native American Chumash peoples navigated these waters with ease using their primitive watercraft, allowing communication and trade between island and mainland villages. In terms of biological colonization, C, the most famous endemic species, though now extinct, was the pygmy mammoth, which is often cited as a case study in insular dwarfism. As of at least 2011, a few endangered species of whale have begun to feed in a new area north of the Santa Cruz and Santa Rosa islands of the Santa Barbara Channel. These whales are at risk to be struck by passing through a shipping lane used to move goods south to Los Angeles. Although a majority of the valley is rural, it does contain urban cities such as Fresno, Stockton, Turlock, Visalia and Hanford. Unlike the Sacramento Valley, the system for which the San Joaquin Valley is named does not extend very far along the valley. Most of the south of Fresno, drains into Tulare Lake. The valleys primary river is the San Joaquin, which drains north through half of the valley into the Sacramento–San Joaquin River Delta. The Kings and Kern Rivers are in the endorheic basin of the valley. The San Joaquin Valley began to form about 66 million years ago during the early Paleocene era, broad fluctuations in the sea level caused various areas of the valley to be flooded with ocean water for the next 60 million years. About 5 million years ago, the outlets began to close due to uplift of the coastal ranges. 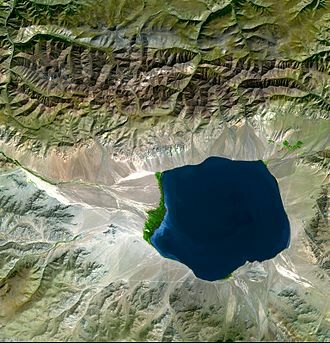 Starting 2 million years ago, a series of glacial episodes periodically caused much of the valley to become a fresh water lake, Lake Corcoran was the last widespread lake to fill the valley about 700,000 years ago. At the beginning of the Holocene there were three major lakes remaining in the part of the Valley, Tulare Lake, Buena Vista Lake. In the late 19th and in the 20th century, agricultural diversion of the Kern River eventually dried out these lakes and its rainy season normally runs from November through April, but since 2011 when a drought became evident it generally received minimal to no rain at all. The drought was still extant by mid-August 2014 with scientists saying it would continue indefinitely. Research from NASA shows that parts of the San Joaquin Valley sank as much as 8 inches in a four-month period, the sinking has destroyed thousands of groundwater well casings and has the potential to damage aqueducts, roads and flood-control structures. In the long term, the caused by extracting groundwater could irreversibly reduce the underground aquifers water storage capacity. The National Weather Service Forecast Office for the San Joaquin Valley is located in Hanford, Weather forecasts and climatological information for the San Joaquin Valley are available from its official website. Lithographic limestone from the Gerofit Formation (Turonian) north of Makhtesh Ramon, southern Israel; a variety of Jerusalem stone (meleke). The Vasquez Rocks in Agua Dulce, California are evidence of the San Andreas Fault line and part of the 2,650-mile Pacific Crest Trail. Tectonic evolution of the San Andreas Fault. Anticline exposed in road cut (small syncline visible at far right). Note the man standing in front of the formation, for scale. New Jersey, U.S.A. Downtown Los Angeles on a typically sunny day, but with unusual atmospheric clarity. 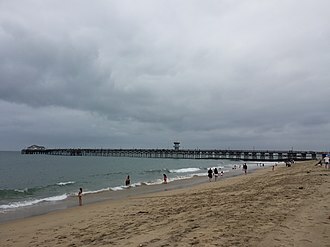 Typical June Gloom conditions in late morning at Seal Beach, June 2013. Rain clouds breaking up over South Los Angeles. The Ellwood Oil Field and South Ellwood Offshore Oil Field. Other oil fields are shown in gray. Sandpiper Golf Course with derricks in background, 1975. Photo by Charles O'Rear. Location of the Long Beach Oil Field in the context of the Los Angeles Basin and Southern California. Other oil fields are shown in dark gray. Detail of the Long Beach field, on an aerial photograph base, showing its position within Long Beach and surrounding communities. Location of the Wilmington Oil Field within the Los Angeles Basin. Oil fields are shown in light violet. Terminal Island drilling and production operations in the 1940s. View from Inspiration Point in the Laguna Mountains, 2013. Chaparral in the foreground, Anza Borrego Desert State Park on the right of the background. Location of the Brea-Olinda Oil Field in Southern California. Other oil fields are shown in dark gray. Detail of the Brea-Olinda field and adjacent areas. Black dots are oil wells active as of 2008. Detail of the Inglewood Oil Field, showing its position relative to nearby cities. Active oil wells are shown as black dots; blue dots are active water injection or disposal wells. Location of the Salt Lake Oil Field in the context of the Los Angeles Basin and Southern California. Other oil fields are shown in gray. Detail of the Salt Lake and South Salt Lake Oil Fields, showing their position within Los Angeles and surrounding cities, and also showing the locations of the active drilling islands. Looking south-southwest, across the Santa Barbara Channel; the city of Santa Barbara, California is below, and Santa Cruz Island is in the distance.